The MÃ¼nchen Volkshochschule is the Munich High School for Adults. The new term starts every year in September. You have to register in person on the opening day in September to guarantee a place. Or alternatively you can pick up remaining places on-line at a later date. Many courses are extremely popular and even if you arrive at 7am to register you might still be in a queue behind 150 others. Courses include metalwork, cooking, gardening, dance, fashion, photography, and many more. 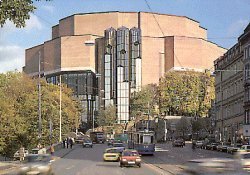 Above photo: Munich's Gasteig. Home of the Volkshochschule. The MÃ¼nchener Volkshochschule has it's headquarters at the Gasteig. This is the large modern-looking red-brick building on Rosenheimerstrasse just up from the Deutsches Museum. Also see the TT discussion forum for more chat about the Volkshochschule and the Autumn 2004 term. And if you're looking for a German school but would like to know about options other than the VHS, try TT's page on German Language Schools in Munich. Not able to comment on the German courses held here but went looking for an oil/w colour course last time around ... impossible. Staff there were not so helpful, just pointing to a bloody great encylocpedia, chained to the desk, showing all the courses. Then when eventually came to enroll you need to get there and line up a night before. Very much like first day of the January sales. I've taken various MVHS courses for the last few years - I canâ€™t recommend them enough. I'm way too lazy to get up and queue for a couple of hours, and usually register over the phone the following day. While it sometimes takes a while to get through, I've found the staff to be consistently helpful and patient (unusual in itself for Munich) and never object to me registering for friends either. The range of courses and locations is amazing, I've yet to find cheaper. You can study anything from pilates to history to obscure foreign languages, or take part in one of the many historical walks around the various parts of the city - brilliant. I found the German classes very good quality and very affordable compared to other classes I have taken at Berlitz and UCLA. The only problem is the lack of good organization as to which class to start with if you have had some German. Also the catalog is all in German which is not so good if you are trying to learn German. Have someone that can translate it for you. just for info..the new catalogue is out on the 26th of January and enrolment is on the 12th of February.you also have the option of enrolling online these days! no need to queue or phone! This page has been viewed 41,654 times.